The lower limb veins are anatomically and functionally classified into three categories – Superficial veins, Deep veins and Perforating veins. The superficial veins basically consist of the great and small saphenous veins, which, correspondingly, stand for pre-axial and post-axial veins of the emergent lower limb. They are located within the superficial fascia superficially towards the deep fascia and as a result of the existence of the smooth muscle, they are thick walled. Their valves are more frequent in their distal part compared to the proximal part. Strong muscles enclose and reinforce them. They accompany the arteries. As a pair of venae comitantes, they are situated under the knee alongside the arteries, however, they create single large vein above the knee. With the exception of those inside the soleus where they are arranged in the form of venous sinuses a.k.a. soleal sinuses, all the veins from muscles draining into deep veins also possess valves. The perforating veins links the superficial veins together with the deep veins and perforate the deep fascia. From the superficial veins towards the deep veins, the valves facilitate only one-way flow of the blood. There are around five perforators alongside the great saphenous vein, and one perforator beside the small saphenous vein. The great saphenous vein is located within the superficial fascia. 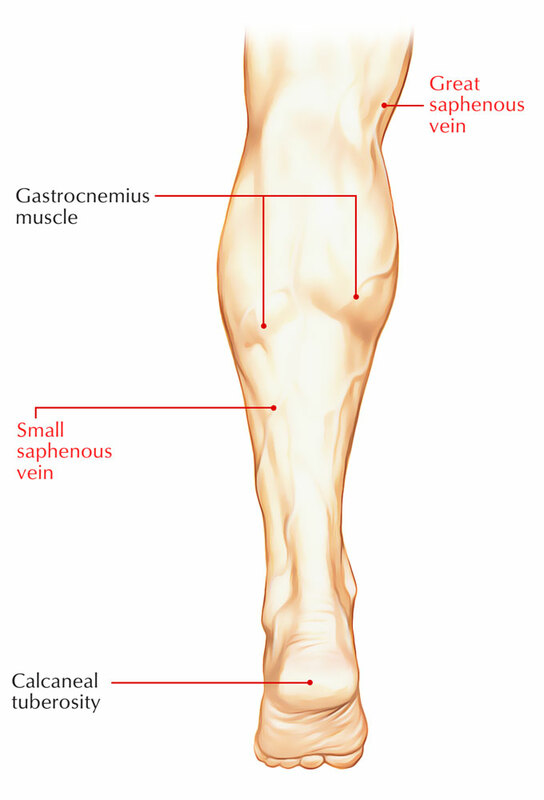 The great saphenous vein symbolizes the pre-axial vein of the lower limb and is the longest vein of the body. It is also known as long saphenous vein. At the beginning: Medial marginal vein of the big toe. In the leg: Communicating veins and Posterior arch vein. 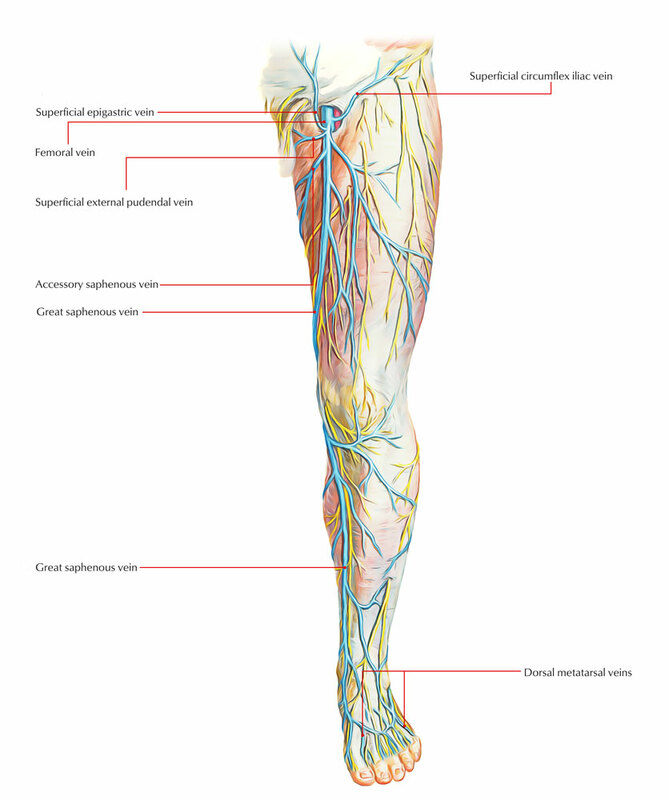 Just below the knee: Anterior veins of the leg. In the thigh: Anterolateral vein and Posteromedial vein (accessory saphenous vein). Just before piercing the cribriform fascia or veins that go along the equivalent superficial branches of the femoral artery: superficial epigastric vein, superficial circumflex iliac vein and superficial external pudendal vein. Near the termination in the femoral vein: Deep external pudendal vein. Small (short) Saphenous Vein is formed by the combination of the lateral end of the dorsal venous arch, and the lateral dorsal digital vein of the little toe, inferiorly and posteriorly towards the lateral malleolus. On its lateral aspect, it goes along with the sural nerve, while it travels superiorly at the back of the lateral malleolus, alongside the lateral border of tendocalcaneus. Afterwards it pierces the deep fascia, travels in the middle of the back of the leg, and until it arrives at the middle of the popliteal fossa, it takes a subfascial path in the middle of the two heads of the gastrocnemius. Later it turns interiorly in order to terminate into the popliteal vein. While going deep to superficial, the posterior femoral cutaneous nerve goes along with the upper part of the vein. They are communicating venous channels among the superficial and deep veins. Since they perforate the deep fascia, these veins are known as perforators. The perforators are classified into two types: indirect and direct. Indirect perforators link the superficial and the deep veins indirectly via muscular veins. Direct perforators directly link the superficial veins and the deep veins. 1. An adductor canal (Hunterian) perforator. 2. A knee perforator (Boyd’s perforator). 3. A lateral ankle perforator. Deep veins of the sole (e.g., medial and lateral plantar veins). Venae comitantes convoying the dorsalis pedis, anterior tibial and posterior tibial arteries.